My father, Enrique Martinez Sr., was a great role model. That is not to say he was perfect. He was first to own up to his many faults, in particular his perfectionism and a lack of patience. In fact, though he taught himself to play a Hammond B3 organ and made a living as a jazz musician for over 30 years, he readily acknowledged that his lack of patience was the chief reason why he was not able to teach me (or anyone else) how to play. That is ok because, thankfully, he had plenty of great qualities I was able to emulate: kindness, thoughtfulness, compassion, empathy, and love for others, to name a few. In a previous post (“Parents, Gratitude, and the #EnriqueEffect“) I wrote about some of these qualities, and how they led to my efforts to pay it forward whenever I can in daily life. I was inspired by the way my father would randomly hand-write letters to friends and relatives; by the way he would record cassettes of music which sounded more like a radio program than just a mix tape, and give them as gifts; by the way he would donate time, resources, or what little money he had available to help someone in need. When the “EnriqueEffect” came to be, the moniker may have come from a friend incorporating my first name in the title; but in my heart it was always a nod to the man who raised me with those very values. So it was hard to learn that what I thought I was doing to pay forward, do good, and make people happier, was actually doing exactly the opposite. I was taken aback, and they could tell by the look on my face. “I’ll give you a prime example,” they said, as they reminded me of a time some years ago when I was living in Oklahoma City. I learned that a group of friends back home was getting together for drinks. Unable to be there in person, I made arrangements to pay for the first round. My friend now enlightened me to the fact that the reaction was quite the opposite. “Enrique tries too hard,” was the consensus that evening, and apparently made everyone uncomfortable. I was crushed. Not only did I learn my gesture had such a negative impact, but also to realize no one had told me so for years. On the one hand I was grateful to learn this new information regarding how my actions were being taken, but on the other hand it led to a cascade of pondering just how many other times the EnriqueEffect actually did more harm than good. The time a friend was coming in from out of state for a gathering, I couldn’t make it, and I bought them a round at the bar. The time I took a potted flower to a friend having a bad day. The time I printed and framed a friend’s favorite photo, and delivered it on a visit back home. The time I sent a craft store gift card to a friend in need of a little cheer. All these instances, and so many more, bombarded me in waves, and it was all I could think about. I’ve thought, and thought, and thought about this for days, now. I still don’t know when it went off the rails, but the fact is that it did. 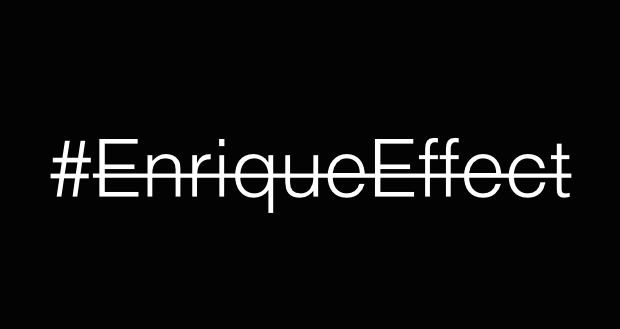 And so, to anyone reading this who may have been on the receiving end of the “EnriqueEffect,” I sincerely apologize for any offense caused by my actions. I can honestly say there was never any ulterior motive behind any of the giving. All I ever wanted to do was add a little joy to a person’s day, and hopefully inspire others to do likewise. To learn that I have instead made you uncomfortable, or perhaps even insulted you, is truly painful to me. All I can say is I am so very sorry, and I hope you will be patient with me as I learn to refrain from going “too far” in the future. While chatting with a friend about this topic, she brought to my attention a couple points I neglected to include in the original post, and so I am adding them now as I find them germane. I find it sad in this alleged enlightened era that we as a people can only give gifts or donate to causes in or around December. Doing good for one another is something we should do all year long. The problem with giving to someone in need is we don’t always know when someone is in need. You never know when a kind gesture can turn someone’s day around, or possibly even change their life. And we should always want to do good things for those for whom we care. Otherwise, what’s it all about? After I uploaded the postscript above, the individual to whom I referred in the initial expressed their displeasure with my writing about our conversation without consulting them first. Learning this, I then decided to remove the post. They then deemed that action to be an example of “going to far.” This comment, along with the fact they then called off our friendship just days later after a note I sent was misconstrued and blown way out of proportion, I came to a moment of clarity: The problem is theirs. While I still take the point that not all my efforts are welcomed, I came to realize they truly have issues wherein accepting kindness is concerned. I consider myself quite jaded. After some of my life experiences, I’ve come to have some real trust issues. But for a person to be this dead set against simple acts of kindness is just plain sad. I pray my level of jadedness never reaches theirs, because that has got to be a very pitiful existence. So, while they have for now ruined the joy I once got from doing (what I thought were) good things for others, and I’ve put any plans of starting my own philanthropy project on hold, I hope that one day I will again find that spirit of giving that I once had. We shall see what the future brings. UNC was a good man, that was real deep cuz u just keep being u and just turn a negative into a positive. I’ve been on the receiving end and I was nothing but ecstatic! Thoughtful and considerate was all I received. Keep being a light. Don’t let anyone try to blow out your candle.